From Saginaw Arthur Hill to Grand Blanc the bird gang remains undefeated, in and out of the regular season, while throughout the season, beating each team by at least 3 touchdowns or more. 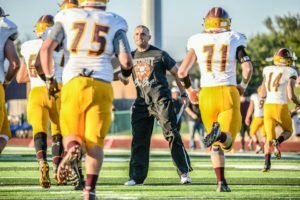 These boys have been literally getting down and push – push – pushing for greatness, and as Davison serenades themselves with yet another sweet sweet 48-12 victory, these hometown heroes overcame from last year and passed the first round and moving onto the second. Clarkston took on long time DHS rival Lapeer and took the win under their wing (48-12). Next Friday, Clarkston will be coming on over to Cardinal Country for the second round. Clarkston’s record in the regular season was 7-2 and this playoff win makes it 8-2. Last time playing Clarkston was in 2012 and they did over come and beat the cards, 41 to 0. DTV will be going live and Kaitlin Abdella and Jordyn Bruns will be announcing the game live at 7 next Friday, on charter channel 191. Davison is close to our third time ever having an undefeated regular season. The last time Davison had an undefeated season was 10 years ago in 2006. 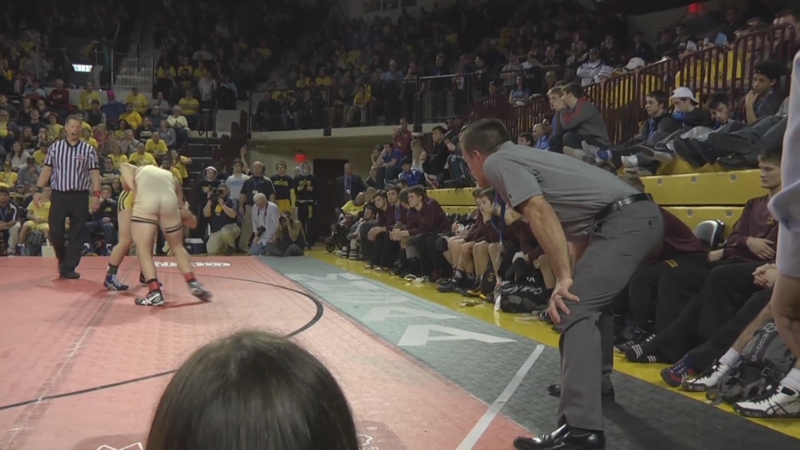 Davison lost in the Semifinals to Muskegon, 43-21. The Only Time was Undefeated before that was 15 years before in 1991 the season was 9-1 and Davison had lost to East Lansing,26-6. Davison played Bay City Western last week and here’s the highlights. This season Tariq Reid had a total of 28 touchdowns this season, scoring four in his last game vs Bay City Western. Austin Rolland scores on a 99 yard kick return making the game 56-7. Davison Football is Back on DTV! The Davison Cards will be playing their first game of the season against Saginaw Arthur Hill, at home in cardinal staduim. DTV will be there catching all the action tonight at 7 in our first live broadcast of the new year. DTV’s own Kaitlin Abdella and school board member Kim Lindsay will be announcing tonight’s action. You can watch the live stream on the NFHS Network & DTVnews.org of tune in to Channel 191 on Charter Cable. The Nest will be pumped and sporting white for tonight’s white out game. But if you are not able to make it, replays will be aired all weekend at noon and 7 or you can always find passed games and stories on our website, dtvnews.org. Watch a promo for the game and video of the team and coach getting ready for the season. The first Genesee County all-star football game came to DHS on Saturday, June 11th. Davison is got the chance to host this sporting event, which took place for the very first time and comprised of senior players from all over the county. Kaitlin Abdella and Chris Jared commentated over the game and DTV also streamed the event live on Youtube and channel 191. Coach Roy Hall and his team in Team States at Central Michigan University this past weekend. The Davison Wrestling team will hit the road and the mats on March 3rd – March 5th at the Palace of Auburn Hills for the Individual State Finals. Max Johnson, Deven Perez, Kurt Schlak, Logan Mabbitt, Tanner Thomas, Ryan Schlak, Brenden McRill, Gabe Ellis, AJ Facundo, Steven Garty, and Brian Case are the eleven taking part in these matches for the title. On top of the individual title matches at The Palace, Coach Roy Hall lead the team to second place last weekend at the Team State Finals. Congratulations to all DHS Wrestlers! Each year, DTV submits it’s projects to two statewide contests held by the Michigan Association of Broadcasters (MAB) and the Michigan Interscholastic Press Association (MIPA). Each contest has categories that individual videos are submitted to. DTV has been earned dozens of awards, most for individual categories, and some for the bigger awards, which you can read about at https://dtvnews.org/awards/. You can check out the content submitted this year on our Youtube page, or the sports content on NFHS. On Friday, January 15th, Lapeer traveled to Davison High School for the first double header that Davison would host this year. Kicking it off at 6 o’clock in the evening the Lady Cards hit the court against the Lapeer ladies and the first few baskets were put up by Lapeer, but the night was just starting for both teams. Davison slowly started to make a comeback in the first period but unfortunately they couldn’t pull ahead by the end of the period. A huge buzzer beater came from the Lapeer at the end of the 1st and it broke the small tie making the score 13-10 Lapeer. It went from turnover to turnover in the 2nd period and Davison was still trailing Lapeer closely! Halftime hit and the score was at 25-22, Lapeer. The ball traveled up and down the court the whole 3rd period. Lapeer put up 14 making and Davison put up 12 making the score 39-34 with the Lapeer lead. Mimicking the other periods, Davison crept Lapeer in the 4th with a score of 39-38 when they were one point away from a tie, but Lapeer got an energy boost and they took 15 more points from Davison as they took 4 from Lapeer and the Lapeer Ladies went home with a win under their belt, 54-42. Soon after the girls fought for a win on Friday, January 15th, the Davison Boys Varsity Basketball Team hit the hardwood against the Lapeer Boys Varsity Basketball Team at 7 o’clock at night in the DHS Gym. The ball was smacked to Brenden Fleming who kicked off the game with 2 points. Noah Dieterle took Fleming’s vibe and put up a 3 for Davison making the score 7-5. New to the team, freshman Cade Coleman took after Dieterle and sinks a huge 3 and yet another before the 1st period came to an end, leaving with a score of 17-14, a Davison lead. Lapeer’s Eric McGeary fires back, shoots a 3, and falls to the ground as the ball falls through the net, making it a 1 point game. Halftime rolled around with a 3 point game, 33-30 and Lapeer has the lead with them when they walk into the locker room. The boys head back out onto the court and instantly Dieterle shows off his shooting skills and puts 3 up on the board for Davison. Lapeer kept the lead the whole 3rd quarter. When the boys looked at the scoreboard, they realized what needed to be done. Coleman and Clark kick off the 4th with a 3 for each, making the score 53-51. Davison’s student section, The Nest, could definitely taste the win and they gave some positive energy to the boys and that energy paid off. Noah Dieterle hits another 3 and as the final seconds of the game run out, Coleman keeps the ball from Lapeer. The Davison Cardinals came away with the win from the Lapeer Lightning. It was like an old-fashioned Big 9 matchup as the Hornets and Cardinals duked it out on the hardwood, but turnovers told the tale of the 1st half. The Cards started off strong with an 8-0 run led by seniors Brendan Fleming and Preston McNab. The Hornets, found their way back after a few bad passes from Davison and tied it up at 10-10. Driving to the basket looked easy for each side, and especially with Davison junior Jacob Chittle putting a show on in front of the home crowd, grabbing 4 baskets in the first half. Despite good offense in the paint, the turnovers continued and Kearsley continued to take advantage of the situation as they lead going into halftime 23-20. Walking out of the locker room in the 3rd, Coach Bobby Hatten obviously made adjustments during half as the Cards brought the reins in and played smart, offensive basketball. With a pair of threes from freshman Cade Coleman the 3rd quarter rounded out with the Cards up by 2, 36-34. Into the 4th, the Cards pushed that lead up as the turnovers stopped and Kearsley was shut down defensively. With a score of 60-46 the Cardinals grabbed the win in the end after great ball movement, put them over the Hornets. Chittle ended the night on top in stats, with 15 points, 3 rebounds and an assist as the cherry on top. Fleming showed his seniority with 8 points, 8 assists and 2 steals. McNab and Coleman walked off with 11 and 7 points, respectively. With a win against a long-time rival, the boys look ahead to a road matchup against Bay City Central this Friday. The records will be even at 1-4 for each side, and both will be hungry for another win. 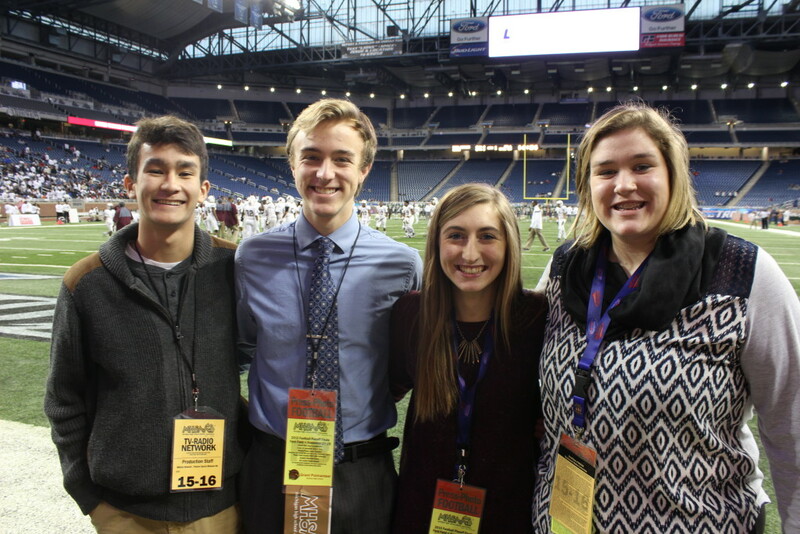 In association with the MHSAA, and the Student Broadcast Foundation four DTV students got the chance to cover the Division 1 State football finals. Grant Polmanteer, Kaitlin Abdella, and Jordyn Bruns announced the game from the press box and Lucas Magno roamed the sidelines grabbing photos of the game. After the game the crew got a tour of the Fox Sports production truck. This is the 3rd year DTV has been invited to cover the football finals.